The TEMA Youth Choir of Ghana joined the Bi-Co Chamber Singers in an open rehearsal and informal concert last Thursday, held in the Campus Center. 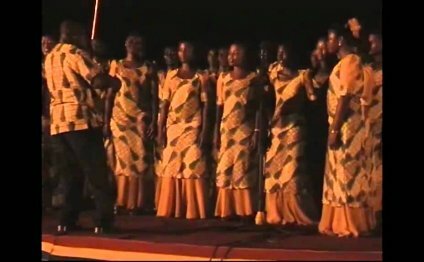 This is the second time the two choirs have sung together; the Chamber Singers traveled to Ghana in 2007 as part of their international touring program for a joint concert. TEMA Youth Choir is a contemporary community choir that is made up of 25 young adults and under the direction of Ebenezer A. Allotey. They are currently on a three-week tour throughout the United States, and Director of the Chamber Singers and Music Professor at Haverford Tom Lloyd reached out to them to reunite for a concert at Bryn Mawr. During the concert, TEMA Youth Choir and the Chamber Singers came together to sing three songs: “Eye Onyame, ” a Ghanaian Christian song of praise; “Ride the Chariot, ” an African-American spiritual song sung with a Ghanaian beat; and “Dinpa Sen Ahonya, ” meaning “a good name is better than riches.” The Chamber Singers also performed “Stan’ Still Jordan/Egbe Nukpowo, ” composed by Lloyd for the 2007 tour. The Chamber Singers of Bryn Mawr and Haverford colleges are a 30-voice mixed choir that performs a wide range of mostly a cappella repertoire from the Renaissance to the present day in original languages. In 1998, the group began its international touring program with their first tour abroad to Venezuela. They have since traveled to Turkey, Ghana, Puerto Rico, Poland, Costa Rica, and Fisk University in Tennessee and study each culture in advance and exchange music with the choir from that country.